Aba. Such a simple word. Made up of the first two letters of the alphabet. Aleph-Bet-Aleph. And yet . . . so much in the space of those two letters. Of this simple word. Aba  father, in Hebrew. And so, as my Aba, and as his daughter, my connection to him is very much emotional. When I think of him raising me with my mother, over the years, I think of all the quirky, unique and fun aspects of him as a dad. Like his childs joy at the holiday of Purim, despite being a serious scholar. Like his pride at the cholent he makes each Shabbos, and the drama with which he chooses a cholent helper each week to be the one to remove the cover of the cholent pot after he does some hocus pocus movement above the pot  the cholent helper to be honored with witnessing the eruption of steam that he calls Aladdins lamp  followed by mock, innocent and effusive remarks at the meal of compliments to the chef and whoever made this cholent, it is DI-VI-NE! Like the old colorful owl pajamas he termed the goonie bird family and made a whole story out of them. Like knowing that his favorite Psalm is Psalm, 65 containing the phrase, Lecha dumiyya tehilla  silence is Your praise. Like taking great pains and pleasure in the challenge of stacking random objects at the Shabbos table as high as he can while keeping them balanced. Like going out of his way to get $2 bills from the bank and always tipping or surprising people with them (and often stacking them in surprising configurations as well). Like loving a short trip to Echo Lake or Mount Evans just to meditate and commune with our Creator. Like goofing around with different accents. And being obsessed with having butter and jam on his challah. Not to mention the infamous onion sandwiches, now dubbed in our family the Hillel sandwich. And, every Friday night, when Aba stands on the bottom step of the staircase as he hovers above us a bit, and gives us bracha, a blessing  which we await each week  we never know what the actual bracha will be (after the yesimech Elokim . . . ), for Aba always continues with a personal bracha, depending on what is going on in our lives, or what transpired that week. Aba. Such a simple word. And yet so much. As strong as these bonds are, Aba has always been a community activist and a super self-motivated person with an unquenchable thirst for Torah, for learning, for a project to enhance the Jewish community or the Jewish people. And its not easy. Being the unusually disciplined and focused person that he is, makes his time and availability that much less accessible. And as light as the connection and many of the memories are, there really is a much more intense side of Aba that dominates his personality, and that, as the eldest of the children, I can say has perhaps gotten more intense as the years have gone by. Aba is a very complex person. And exceptional in that he has a need and a desire  and a natural ability, too  to feel connected to all Jews, regardless of affiliations  across the entire spectrum, from Reform to modern Orthodox to charedi. Limbo Jews, my friend Dr. Heidi Tessler calls us (who is an inspiring model of it herself). Limbo Jews dont classify themselves or see themselves as connected to one specific type. Its a matter of simply being connected to all Jews  wherever each of us might find ourselves on our Jewish journey. Whats the point of all this? This past Sunday night my father hosted a siyyum  a completion of a highly complex learning cycle on the uncommonly studied topic of mikveh. A mikveh is the ritual bath which stands at the center of the laws of intimacy that govern the holiness of the Jewish family. The mikveh is a place that marks and catalyzes transformation, be it for a woman or a convert to Judaism, and, in antiquity, for all Jews. According to Jewish law, when building a new community, a mikveh is the first thing built  before a synagogue or cemetery or community center! Aba has been focused on this project for years now, and finally on Sunday night he realized his dream and celebrated the publication of a sefer, a commentary on the great scholar, the Vilna Gaon (1720-1979), known as the GRA. The GRA is so elliptical  as my father puts it  that to study his writing and to elucidate his insights is a monumental task. On Sunday night at the siyyum I saw Aba with fresh eyes. Not as the daughter of the Aba  with the goonie owls or the Aladdins lamp and so on. I had a more dispassionate, objective perspective and admiration for his accomplishments. 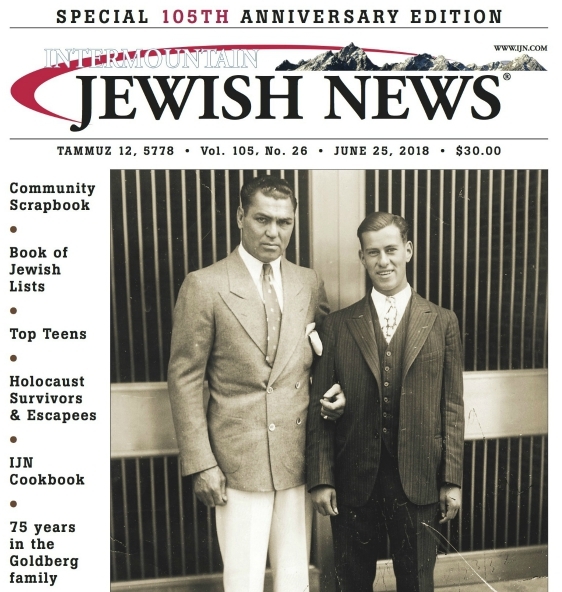 As Rabbi Yissachar Frand put it that evening, Abas sefer or book was produced in spare moments. As editor of the Intermountain Jewish News, Aba is so busy week in and week out, constantly under the pressure of the deadline mode. Also, as Rabbi Frand put it, Aba is not an old person, but he is not a youngster either, and Aba had to train himself with a whole new way of learning Torah in order to accomplish this precious Torah milestone. As many of us who know him  be it as a family member or a friend  that childlike excitement about Aladdins lamp (or good, super sweet cakes and cookies, for that matter) is almost tangible when it comes to his Torah study. Sometimes we dont fully appreciate it when, armed with his childlike desire and passion, he stops us, yet again, with his excitement about a clarity he attained in a specific comment of GRA he had been wrestling with for a long time. Well just kind of think to ourselves, here comes the GRA again, and well half-heartedly be like, yeah, so tell me . . . Throughout these years, as a family, we have been living with Aba and the GRA together. I asked Aba last week what made him decide to focus on mikveh? Of all things, its not exactly the most compelling topic. He responded how years ago he traveled to Salt Lake to help a community build a mikveh and when he got there he realized he didnt know the difference between a mikveh and a bathtub  so he decided to study it. One thing led to the next and before he knew it, he said, it took on a life of its own. The rest, as they say, is history. And that is what Sunday night was. It was history. History for our community  an inspiring night to share of how unlimited our potential is if only we truly focus and tap into it  as Aba has taught us. And history for my family. I feel so blessed to have been there, to have represented my siblings, and shared this moment with both my parents and my grandmother Miriam, may they be blessed with long and healthy life. And Ema. Mother. Again, such a simple three lettered Hebrew word. So simple  Ema. And yet, so much. Emas encouragement through the years has been unlimited. Much of Abas attention and resources have been devoted to this project. Ema never wavered. Ive seen how she has supported it and now, as Rabbi Akiva says, Abas accomplishments really are Emas as well. Anyone who knows my mother knows her as a true example of grace  even if its grace under fire. Both my parents have also taught me what it means to keep a secret, a confidence. The preciousness, the dignity, the trust of a secret  many times at costs to themselves. On Sunday night, it was Aba and Ema as a team. Aba told me another reason he chose the topic of mikveh was because he felt it was limited enough to tackle. (He also later laughed a lot about how naive that was; the topic seemed endless once he got into it.) His goal was to heighten his participation in the conversation of Torah discussion, G-ds word, through the ages. But what I also noticed on Sunday night was that this sefer completes something about Aba. Until Sunday night, Aba had authored four books, from intellectual to inspiration, plus hundreds of articles, addressing practically every dimension of Jewish life. Now Aba has written a bona fide Torah commentary. And so, through his writings, his desire and connection to all parts of the Jewish community are now cohesively and concretely represented. Aba and Ema  we are overjoyed for you and so proud to be the children who were placed in your living care. G-ds blessings and cheilchem loraita  may you go from strength to strength!